What would an Indian family buyer want at a price range of 15-20L on-road. Had this question been asked a couple of years back, the answer would have been ‘Executive Sedans’. The segment is almost dead now! 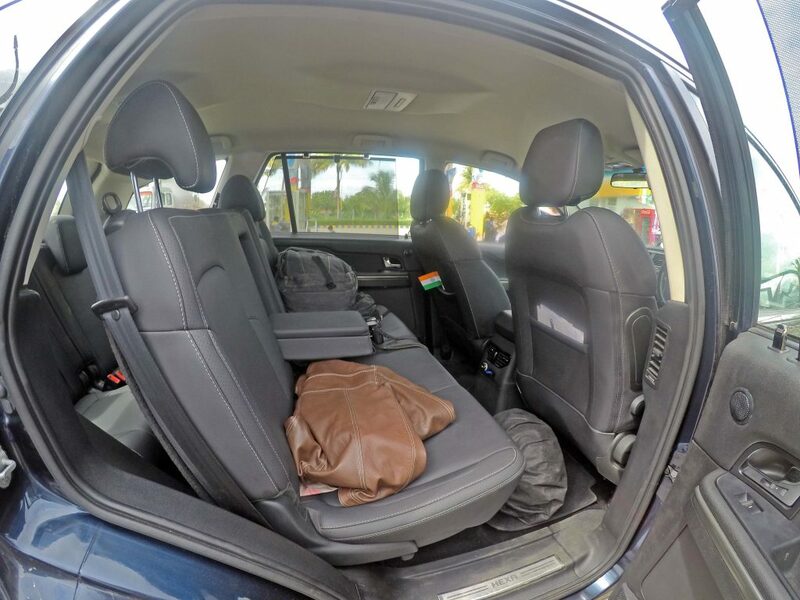 The average Indian family now wants a car that is large enough to accommodate 6/7 people in comfort for long distances, have good luggage space, good features for comfort, tough mechanicals to handle Indian road conditions, a fuss free ownership. This is what the Innova offered. It did not have a long list of features but the important ones to keep your family in comfort. Tata did try to come with a product in 2010 with its ‘Aria’ that tried to satisfy all the above and also offer a little more off-road-ability of SUVs. However, poor marketing, a confusing segment positioning (for Indians) and optimistic pricing ensured it didn’t do well. 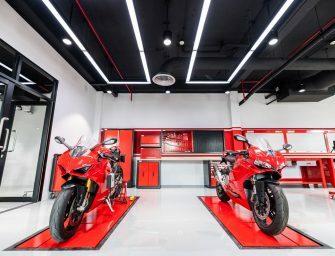 Lately Tata is known for its come back products, where they took their existing cars back to the drawing board, make as many changes as possible and make it look like a new product all together. One such attempt was ‘Hexa’, codenamed ‘Eagle’, that transformed Aria! It was, as we all know, a great product overall. Gone are the days when adding chrome to any car makes it look premium. 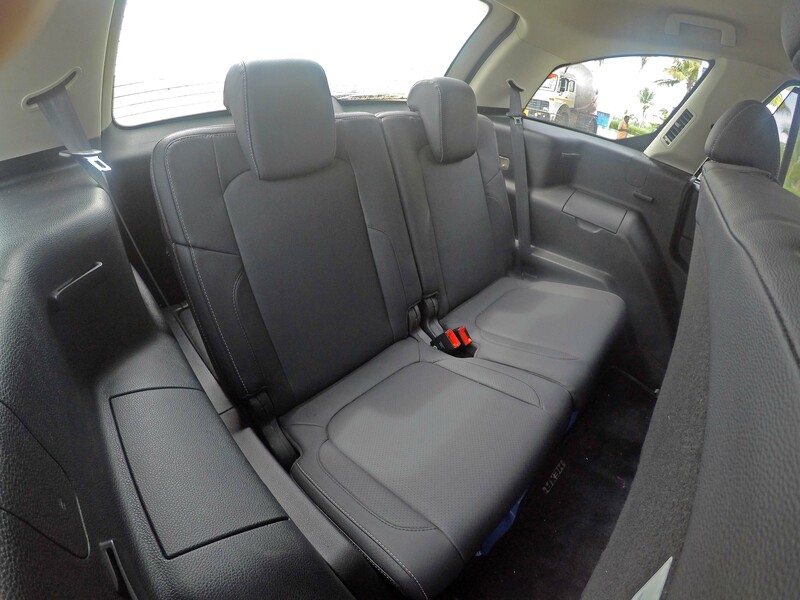 We expect a lot of premium touches in cars in terms of the design, material used, material patterns, etc,. 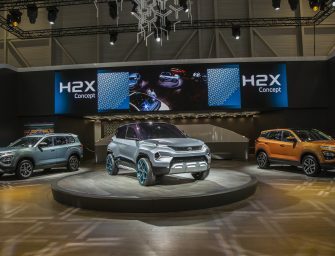 Tata has well understood that and their Design Next concept has taken their cars several notches up in the desirability. At first look, the Hexa looks massive with its living room like proportions that gives it a massive road presence. The design elements like the hexagonal grill, humanity line, the skid plates at front & the rear, the sculptured clamshell bonnet, dual barrel smoked out headlamps with projectors, flared wheel arches, chrome lining on the sides with the Hexa badging, LED DRLs over the fog lamps, black garnish on the doors, black plastic cladding that runs all around the car, those 19 inch wheels (the biggest in this segment), dual chrome exhausts, LED tailmaps, etc, are hard to miss and add character to the car and makes it more SUV-ish. Tata has indeed made it look muscular and aggressive. The chrome is a bit overdone at the rear though with a thick chrome strip running between the tail lamps on the boot door and the chrome lining given on the loading lip of the boot. Overall the car either looks aggressive, massive, rugged, simple or sophisticated depending on the angle you look at. 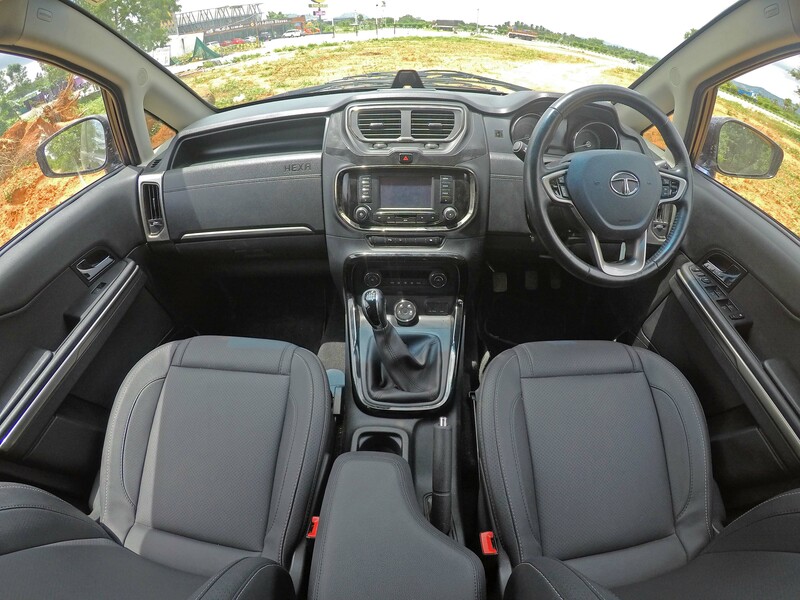 Tata has also learnt the trick of making the interiors feel comfortable & premium. There are some very good design touches like the vertical air vents on the sides, smoked chrome and piano black inserts, white stitching for the materials, Hexa badging on the upper glove box cover, leather wrapping for the steering wheel, soft touch materials at important places like the door pads, etc. Features wise the Hexa is loaded to the brim with a 5-inch touch screen display for the fantastic 10-speaker JBL audio system with smartphone integration, USB, AUX, Bluetooth connectivity along with Voice Recognition, Navigation, on-screen SMS display & readout, rear view camera with dynamic parking guides, smart multi-info display, cruise control, automatic climate control with flow control AC vents for all three rows, window curtains, power socket in all rows, many cup honders, 60:40 split rear bench (7 seater variant) or Captain seats with arm rests, 50:50 split third row both of which are foldable. The seats are 8 way adjustable and are very large and accommodating. Tata’s multi density foam is doing the magic of keeping people in comfort what size or shape he may be. A special mention has to be made here for providing lumbar support not just for the driver but for all 4 captain seats. Overall the experience feels plush, comfortable, convenient, premium & appealing. Another tick in the right box. Now starts the interesting bit of this review. 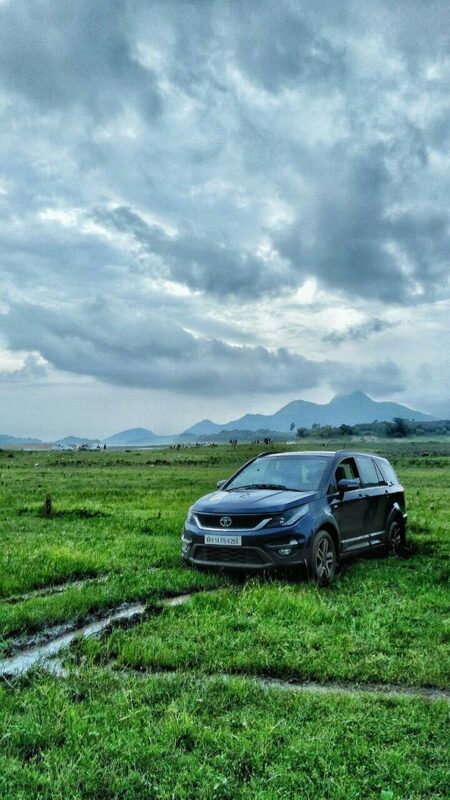 The Hexa is powered by the same 2.2L 16V Varicor diesel engine producing 154 Bhp & 400 Nm of Torque. 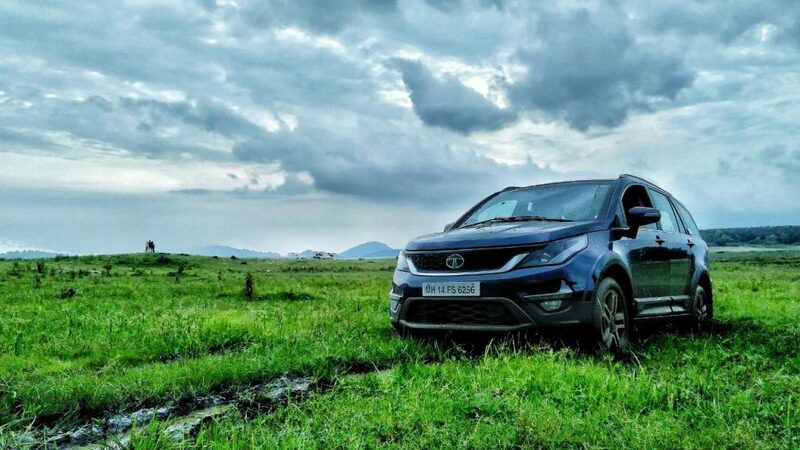 The engine has been used by Tata for well over a decade and they have been learning a lot and the one in the Hexa has the best tuning yet. On paper the power figures seem to be impressive but the weight of 2.2 tonnes pulls down the PTW where competitors like the XUV with its light body excel. Transmission options are in the form of a Manual or Auto with 4×2 and 4×4 options however you don’t get a 4×4 in Automatic guise. 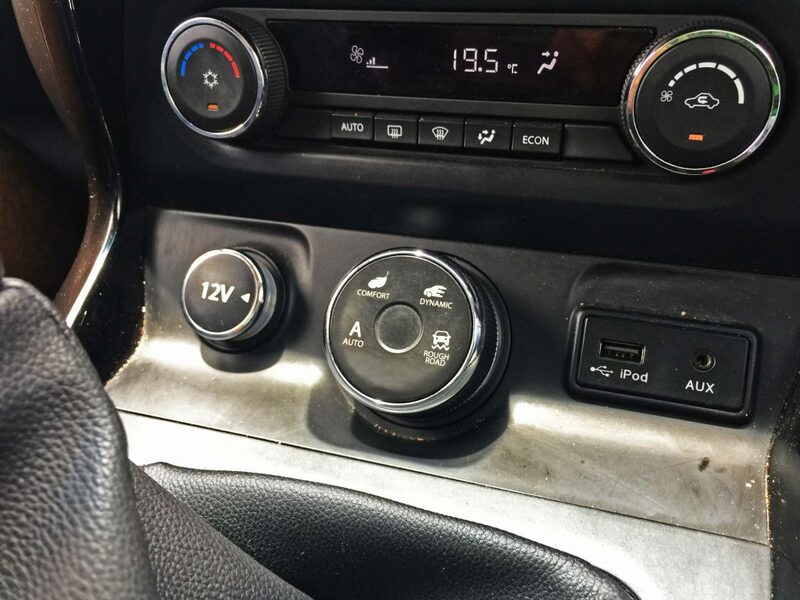 Climb into the car and you find a starter button missing which is now even available in cars many segments below. Twist the key and the car starts with a diesel clatter which settles down in a bit. The insulation is adequate and NVH levels are well contained. The steering is a bit heavy though even in city speeds which coupled with a large turning radius makes it difficult to drive in cities. Head out to the highways and the Hexa picks up speed very well and the 6th gear in the manual makes cruising very easier. Yes. Cruise control is also present. There are these ‘Super-Drive-Modes’ in Tata’s terms to play with which makes driving the Hexa more fun! They can be selected via a Jaguar inspired rotary selector lever (doesn’t go up /down though). Auto Mode : Technically part-time AWD which adapts itself according to the road. Primary drive will be RWD and torque will be sent to the front wheels on demand. If you don’t want to fiddle with the modes and are driving in mixed road conditions, best is to select ‘Auto’ and the car takes care of itself. Comfort Mode : The lazy mode I would say where the power is sent to rear wheels only. 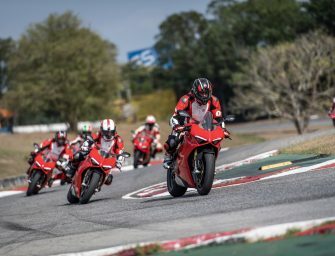 There is a very noticeable difference in the throttle response and power delivery. Guaranteed if you can live with it, you can extract more miles per litre of fuel. Dynamic Mode : Move from Comfort to Dynamic on the move and you will feel you are driving a much powerful car. This mode will offer you the best throttle response and the engine will exhibit its maximum power. This is the most fun to drive mode on the road, so much so that even the ESP will kick in a little late. Rough Road Mode : If you are the off-roading type and want to do some slush fest, get into rough road mode. The transmission gets into 4×4 ideally AWD. The overhangs in the Hexa are not large and so it can take some uneven surfaces. 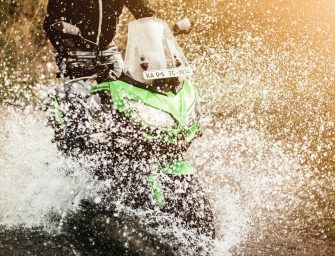 Tatas are known for their Ride Quality and Hexa is no different. 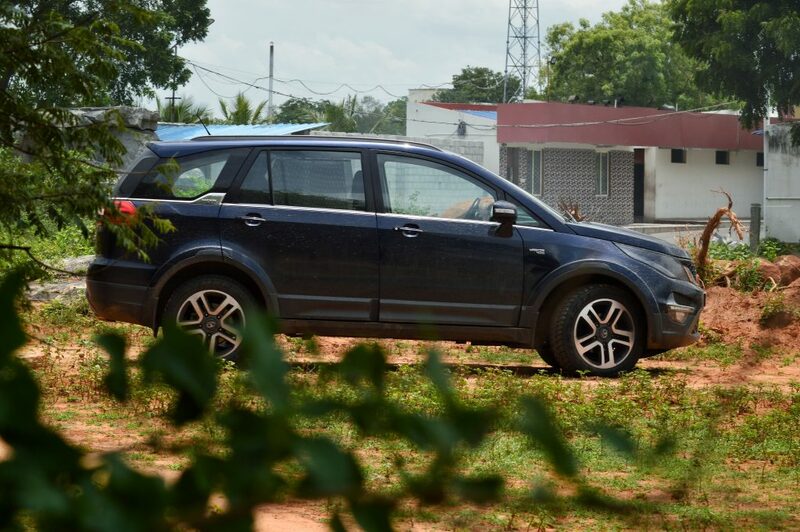 We can easily say that Hexa has one of the best Ride Qualities in this price range. 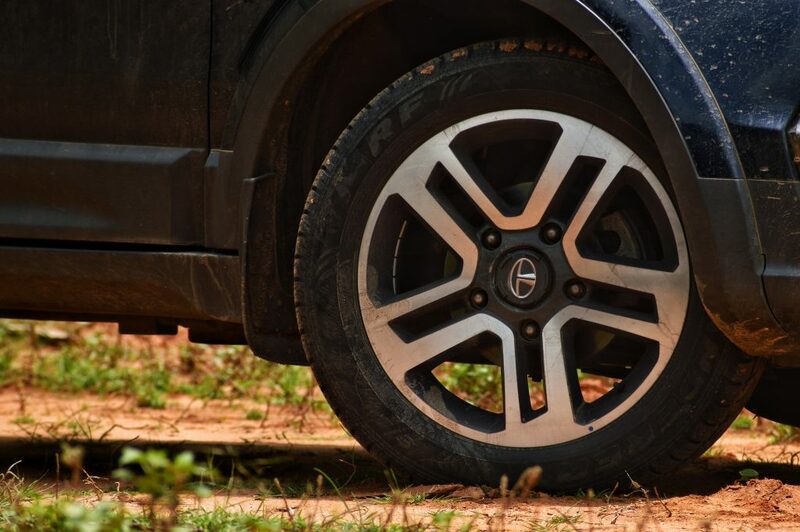 Tata has compensated the 19” wheels with multivalve dampers in the suspension. Cruising on the highway is a breeze… Next time you hit the roads, you will not accuse the Government for such bad roads. With Hexa, any road is a new road, potholes are absorbed like pacman! With such ride quality and 200mm of Ground Clearance, one would expect high body roll. The Hexa surprises here too. The body movement is very well contained, which I would say is equal to the XUV which has a monocoque chasis except during cornering! Although the steering is heavy, the feedback is decent from the Hydraulic units and the new Tata family steering wheel is chick and nice to hold even for long drives, although I felt the horn pad is a bit difficult to reach. It is a tradition at PITSTOP to ‘TEST’ the car to the fullest capabilities, sometime beyond. You can look at the images to understand what it is! Jokes apart, Hexa is definitely a good off-roader considering the dimensions and the weight of over 2.2 tonnes it carries. The hill hold and hill descent along with anti-rollover mitigation aids in balancing the living room on 2 or 3 wheels when required. There are no stuffs like manual differential lock (gets LSD on both axles) or a low ratio transfer case to make it a serious off-roader. Tata please give us 4×4 AT with Super Driving Modes! Tata has loaded the car with myriads of safety features. 8 Airbags, Traction Control System, 4 channel ABS with EBD, ESP, Cornering Stability Control, Torque on Demand, Hill Hold & Hill Descent Control and 4 wheel disc brakes! Again, ATs don’t get the ESP! 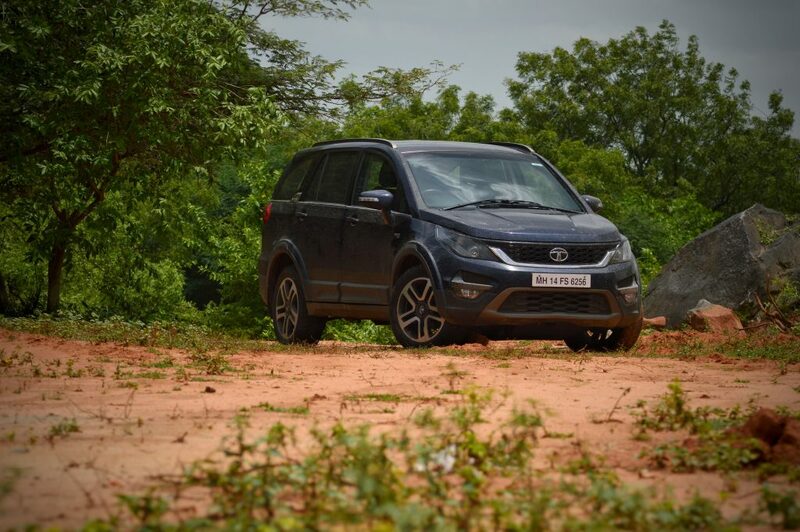 Overall Tata has left no stone unturned in making the Hexa an SUV rather than an MPV. It is loaded with features, it is comfortable, powerful, safe and as I repeatedly said has living room like space. 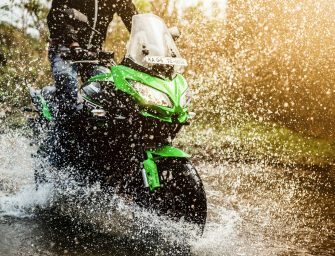 Since launch, the Hexa doesn’t seem to have tasted run away success like even the newly launched Jeep Compass which is said to have raked in 8100 bookings! For Tata, as we all know, success is not selling more units but fully satisfying the few thousand customers they get! Tata has done a commendable job and we are sure they will throw in a lot of surprises with the upcoming Discovery platform based SUVs! Competition better be ready!